The Military Shoot for June 30th will be rescheduled for a later time. Stay tuned to the web calendar for updates. Enjoy your Canada Day Long weekend. Again this year Whitehorse will be hosting the Junior Canadian Rangers from across the north in their summer training exercise. For seven days starting Saturday June 22nd at 8 am through to the end of the day on Friday June 28th, the Whitehorse Rifle and Pistol Club will be closed to general access by members and user groups while these youth are on the gun range. The JCR’s will be occupying all areas of the range for their shooting experience. Members are welcome to come up after 5pm for the regular schedule of activities. 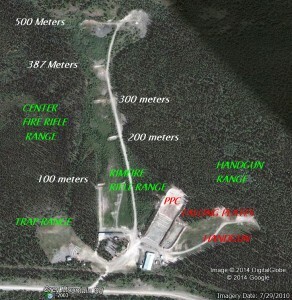 Sponsored by the Yukon Shooting Federation, the annual Yukon Rifle Silhouette Championship will be held Saturday and Sunday June 15th & 16th at the Whitehorse Rifle & Pistol Club. All are welcome to participate. Registration opens at 0800 am on Saturday. Guns are weighed in on Saturday morning.Shooting starts at 0900 am. On Sunday, shooting continues beginning at 0900 sharp. Registration fees: $10 per rifle classification. The SKS shoot is a fun family event that requires no skill. Events such as the Balloon Bust, Water Jug Race and SKS golf are more about luck and sending lead down range. Don’t worry if you don’t own an SKS rifle, just come see the fun and we can loan you one or share during the event. Just bring 7.62X39 rounds or we can sell you some at the event. Open to all ages and skills. Come see what the fun is all about. Contact Mike @ 335-1776 for more info. Wind up SKS Shoot Sunday Sept 15th with a BBQ to follow. ** Please note a typo on the Fun Shoots Schedule that shows the first SKS Shoot on June 30th – that should read June 3rd. The web calendar is correct. Can you spare a little bit of time to clean up the gun range? Dress for dirty work! Don’t forget to wear shoes suitable for working in the rough areas of the range. Bring your work gloves and bug repellant and maybe the sunscreen, too. Sunday June 2, 2013 10:00 am to 2:00 pm. Cease fire on the entire range during this time. Jobs to be accomplished: pick up of paper and other debris from around the site, empty garbage barrels, wash windows, rake gravel away from the building foundation, pick up discarded brass, clear brush around the target areas, paint, repair targets, fix the outhouses, and small jobs. There are woodworking projects that need to be accomplished. If you have the time and the skill to build or repair, come and find out what needs to be done to improve your club facilities.